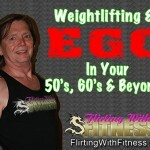 When it comes to weightlifting and exercise, ego has created a true dichotomy for those in their 50’s, 60’s and beyond. From commercial gyms and marathons to sports arenas and baseball diamonds you’ll find older athletes of all ages, but then you’ll meet just as many or more people in their 50’s and 60’s who can only truly be referred to as ‘old’. So what’s the difference between these two groups and why is the gulf widening between ‘boomers’ and ‘zoomers’? The biggest difference is lifestyle, and lifestyle is a choice. And that choice is often based entirely on ego – how you see yourself. If you choose to judge yourself by financial success, you’ve probably made that your focus for most of your adult life, concentrating on making money and getting ahead, leaving little room for health, family time and outside hobbies. If you picture yourself as a parent and grandparent first, you’re probably a nourisher who dotes on their kids and grandkids, even though it’s meant a little less materialistic gain and probably carrying some extra poundage around each day. If you’ve always seen yourself as healthy and energetic, you’ve most likely been more careful to maintain healthy nutrition and been lifting weights, doing yoga or Zumba and/or been out running regularly. And that’s where the divide comes from – the lifestyle you’ve chosen up to this point. For most people, by the time you’re in your 50’s and 60’s you’ve already experienced the illnesses, suffering and deaths of loved ones or even those you’ve grown up with. 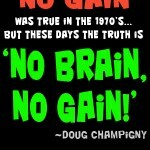 Staying in great shape, weightlifting and exercising and eating right wouldn’t have prevented all of those deaths, but how many might have avoided or at least survived those strokes, heart attacks and other fatalities if they’d been strong, healthy and carrying around the right weight for their frames, being neither underweight or overweight? Look at what doctors and researchers say about diabetes, heart attacks and the like – over and over you’ve seen their advice to exercise to reduce the risks and severity. Look at seniors who have had bad falls – those that can cause a broken hip or pelvis, for example. Many never fully recover and pass within a couple of years, while stronger, healthier people heal fairly quickly and go back to their active life. And how many of today’s diseases that plague older segments of the population come from a lifetime – or even a few years – of poor nutrition? Even if you ignore the life-threatening situations and conditions, compare the daily lives of the two groups. Modern day life is filled with stress and that has a major effect on both mind and body – but it affects healthy people to a lesser degree as their minds and bodies are much stronger. How’s your energy level? Are you too tired to get everything done and still go out in the evening? Or do you bounce out of bed when you get up and still love going out to the theater or a game and then out with friends for a late dinner afterward? Is your idea of fun playing squash or tennis or completing a 10k run, or getting home and flopping on the couch in time for Downton Abbey or the latest ‘reality’ show? Was last night’s dinner fast-food takeout, a box of cheesy macaroni or chicken, yam and sweet potato? The bad news is you’re where you are based on the choices you’ve made – and that’s ego. The good news is you can rein in that ego, put some self-discipline into action and change the segment you’re in. Because of the cumulative effect of your lifestyle to this point, the older you are the more imperative it is that you speak to your doctor and discuss what issues you need to consider as you change your diet and exercise level. Not the usual generic concerns, but what YOU, with YOUR history and in YOUR current condition, need to be aware of. In most cases, if you tell them you’re serious about getting back in shape you’ll get a hearty “Go for it!” from a very surprised medical professional – your history to date most likely didn’t have them expecting you to suddenly value your health and wellness! 2) Where should you start, given your current condition and age? What you really want is a body that’s capable of doing whatever you want to do, having the strength to do it and the energy to not only do that but then continue merrily on with the rest of your exciting day, right? Oh, and waking up without all the aches and pains might be preferable too, yes? Being able to breathe after a 10k run at least as easily as you can today after climbing a single set of stairs? Another favorite of people in their 50’s, 60’s and beyond is being able to lay down at night and drift off to sleep quickly, then stay asleep long enough to wake up refreshed, energetic and ready to take on the world the next day. Put all those together and does that sound like something worth chasing and achieving? Great! But while almost everyone in the 50’s, 60’s and beyond will agree with your goals, things vary greatly when it comes to where to begin. This is the most important aspect of getting strong and fit in your 50’s, 60’s and even your 90’s and 100’s, so give it considerable thought. You DON”T want to get hurt and end up in hospital – and that can happen to teens and twenty-somethings too if they start off wrong. What DOES matter is your current state of health and how long it’s been since you exercised regularly. If you’ve always stayed active and at or near your ideal weight, you can probably improve your nutrition and start lifting weights right from the get-go – just start light and build from there. If you’ve been retired for a few decades and spend most of your day dozing in your chair in front of the television, as long as your doctor approves of it start by walking a bit further each day. If you’ve got arthritis in your knees and hips and can only walk 100 steps, do it. Then tomorrow walk 101 steps. The next day 102 steps. And clean up your diet right away, since your ailments don’t affect your ability that way. However, if you’re morbidly obese at any age, start with diet modification. Replace the simple carbs and refined sugars in your daily meals with brown rice or yams, vegetables like broccoli and spinach and apples – all in reasonable moderation, of course. Work with your doctor to keep you on track and monitor your blood sugars and blood pressure, and once your weight has started to drop get your doctor’s OK and start a walking regimen. Start with a shorter walk, going just farther than you’ve normally been doing each day to date, then build on that distance. Before too long you’ll be able to lift weights too. Weightlifting helps two ways – the calories you burn while weightlifting and the new muscle you put on, muscle that burns calories 24/7. 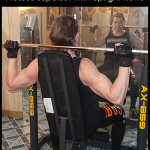 Your goals in the gym, whether you’re 50, 70, 90 or 110 should be improved strength, flexibility, stamina and balance. Don’t let a personal trainer or some gym rat tell you you need to stick to exercise machines to keep you ‘safe’ – using free weights that are the right weight for you and doing the big compound exercises with proper form will keep you safe. Avoid the urge to go too heavy, but don’t let fear hold you back either. Start with a weight somewhat lighter than you think appropriate and increase it as time goes on. Hopefully over the years you’ve learned some patience, so starting lighter and working your way up to where you think you should start shouldn’t be an issue. Wait til you see how you feel 2 or 3 days after the workout before deciding if the weight can be increased, and even then keep each increase small – fitness is a lifestyle, not a race. While your body will still react like a teenager’s in that it will build muscle and strength if you’re lifting weights and eating right, it will take longer to recover between workouts, at least til you’re back in fit condition. So start by planning two full-body workouts a week, on Monday and Thursday, Tuesday and Friday or Monday and Friday. At first, if you’re still sore or stiff from your last workout, skip this workout. You won’t get the same progress from just one workout that week, but you will keep from backsliding and losing any hard-won gains – and you’ll be back to your 2 workouts a week in no time. A few months down the road you’ll have the energy and strength to kick it up to three workouts a week, but for the first few months stick to just twice. You’ll know when to add in that third workout a week – your body will tell you. None of this has to cost a lot – healthy nutrition is cheaper than fast-food outlets, and you can get started working out with a single pair of dumbbells and grow from there if need be. Look for results, not excuses. You’re where you are through the choices you’ve made, and you can get to where you want to be by changing those choices and showing a little self-discipline and intestinal fortitude. 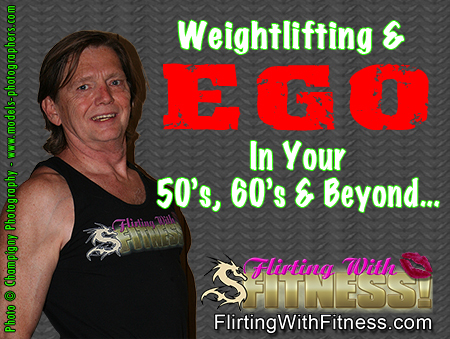 Don’t let your ego hold you prisoner any longer – start eating right and weightlifting intelligently and get back to truly enjoying an active and energetic life! Note: For more info on being healthy, fit and happy as you age, be sure to download our free guide: ‘Reversing The Aging Process‘ today. This entry was posted in Building Muscles, Fitness For Seniors, Fitness Lifestyle, Healthy Longevity and tagged 50's, 60's, boomers, build muscle, ego, exercise, goals, healthy, lifestyle, strength, weightlifting. Bookmark the permalink. Nice post Doug. I’m a believer in balance. Ima family first guy with two kids and counting and still make fitness a big priority. I also enjoy flopping on the couch in the evening and watching movies etc. I feel that by doing it all it all feeds itself. If by being fitness focused you neglect your kids, then that will eat at you and make you unhappy and that in itself leads to illness and imbalances both physically and mentally. Absolutely make health and fitness a priority, but do it for the right reasons and you’ll discover you can go further than you ever thought possible. So VERY true, Matt! And you’re right – it takes focus AND balance… Neglecting your family, finances or spiritual development is just as bad as ignoring your health; a disciplined mind keeps physical, financial, emotional and spiritual development level while working to improve all 4 areas together. What an excellent encouragement to all of us to keep exercising and looking after ourselves as we age. Getting fit, not fat is the challenge. Graham Forbes recently posted..Fitness Trackers: Are They Worth It? Thanks, Graham! To take it even one step further, it’s to try to reach the point where age isn’t a factor. For Teri and me, we never think about being ‘too old for that’ or about doing anything ‘at our age’. Definitely leads to a more active lifestyle than most people we encounter on a daily basis!